Lily hasn't always had it easy, but that's never stopped her from working hard the life she wants. She's come a long way from the small town in Maine where grew up - she graduated from college, moved to Boston, and started her own business. So when she feels a spark with a gorgeous neurosurgeon name Ryle Kincaid, everything in Lily's life suddenly seems almost too good to be true. 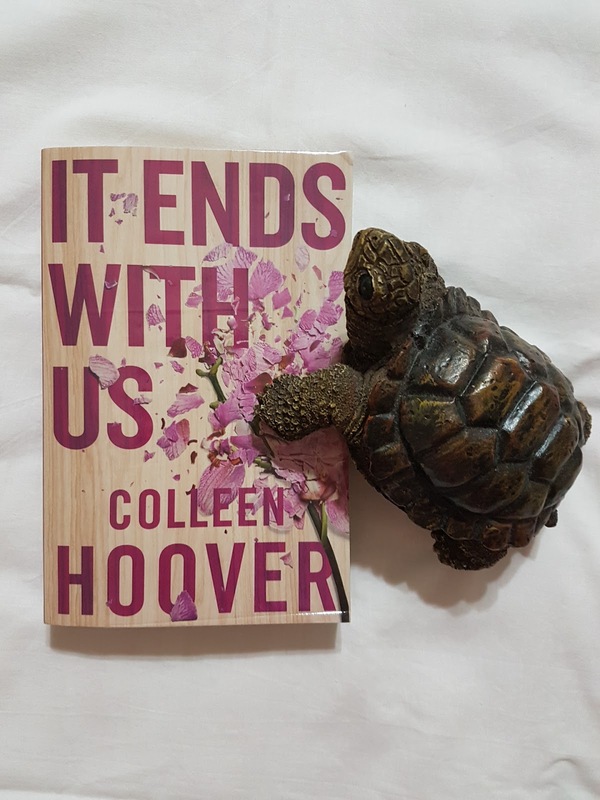 As questions about her new relationship overwhelm her, so do thoughts of Atlas Corrigan - her first love and a link to the past she left behind. He was her kindred spirit, her protector. When Atlas suddenly reappears, everything Lily has built with Ryle is threatened. - excerpt from book. It Ends With Us by Colleen Hoover is a new adult genre and it's my first time attempting it. There have been many raves about this author for this genre, so I decided to try it by reading the latest published book. I went in without any expectations and I was quickly hooked to it. I really love it from the start to end as it brings out a good topic of domestic abuse. Jumping into the plot, the beginning itself will capture your attention as a little bit of mystery surfaces for the characters. I love that the timeline of the story progresses with a good pace where days and months are clearly mentioned and not everything happens in a short period of time. As we journey further, there were some twist and turns that were fun to read about and when the big one comes it makes such an impact that you will feel for the characters. The author does a great job in keeping you addicted to the pages. The characters surely gave life to the story while stressing on the importance of the message. I love how the main heroine meets all the new people in her life and their interactions with her is intriguing and heart warming. Her relationships with other characters are well written and realistic. I especially love her interactions with the men in her life and the conflicts it causes has so much tension. The thoughts of the main heroine is definitely realistic and thought provoking for women in love. I often feel pain and sadness for her, not that I can relate to it but I definitely can sympathise with her. Overall I quite enjoyed my time with the book as it managed to keep me interested and I wanted to read it as soon as I had free time. I did tear a bit as it was such a dear story to the author herself. The author has certainly made it to my authors to take note of list and I'm excited to read her other books. 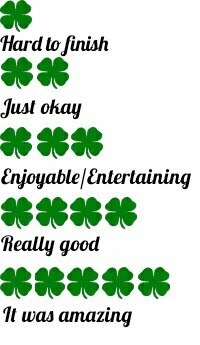 If you're new to her and this genre I suggest to just try any of the other titles as most of it have quite good reviews. Readers who enjoy realistic love should pick up this book and I hope your heart will be touched. Katie Brenner has the perfect life: a flat in London, a glamorous job, and a super-cool Instagram feed. OK, so the truth is that she rents a tiny room with no space for a wardrobe, has a hideous commute to a lowly admin job, and the life she shares on Instagram isn't really hers. But on day her dreams are bound to come true, aren't they? Until her not-so perfect life comes crashing down when her mega-sucessful boss Demeter giver her the sack. All Katie's hopes are shattered. She has to move home to Somerset, where she helps her dad with his new glamping business. Then, Demeter and her family book in for a holiday, and Katie sees her chance. But should she get revenge on the woman who ruined her dreams - or try to get her job back? Does Demeter- the woman who has everything- actually have such an idyllic life herself? Maybe they have more in common than it seems - excerpt from book. 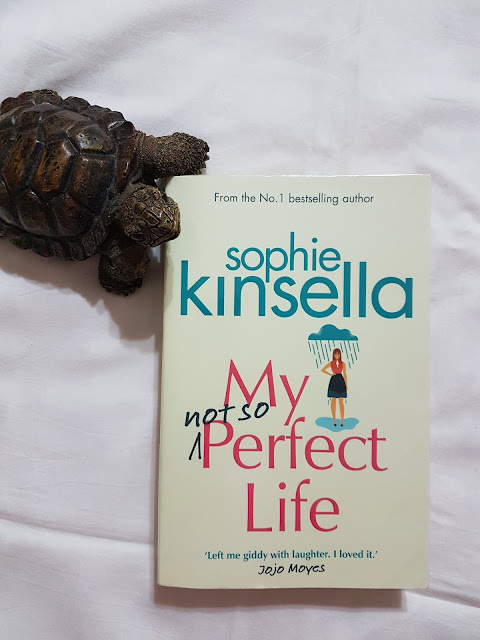 My not so perfect life from Sophie Kinsella is a standalone novel about a woman who lost her job and maybe her dreams and then an opportunity to get revenge surfaces. This author is naturally an auto buy for me as I have always been well entertained with her stand alone novel for years. The summary at the back of the book is just the surface of the book and it's one with more meaning to it than you expect. It's definitely funny at certain parts and also some self discovery. At first I was a tad annoyed with the main character Katie as I felt that she can be long winded and too naive but as the story progresses there's more to her than meets the eye and I'm glad that the character did have some growth. As for the side characters they surely made interactions fun and interesting. I think those characters actually kept the story going at some point in the middle and you could feel the pull of wanting more for them. The personalities of those characters complements the actions and attitude of Katie quite well. The flow of the story was a bit dry here and there which did not grasp my attention well enough until part two started and then I was hooked. The twists in the book weren't really jaw dropping but just mediocre to the point that I could predict some of it. But nonetheless it's the typical Sophie Kinsella writing that you would expect and to compare with her other books this was not impressive. I would have prefer more Oh My God moments between Katie and a certain someone and more emotional between the family. As those laugh out loud moments, I still felt it was lacking as I have been spoilt by her other books. I will give credit to the meaning of this book and what the author is trying to tell her readers. In this current technology generation, it's obvious that we should always be reminded you only see what you see, you do not know other people's story. It's a quick read so if you're a fan of Sophie then I think this would be a good book to read but not necessary. If you have not tried any of her titles, this book is not a good start because it does not highlight her best writing, I would introduce you to Twenties Girl or Can you keep a secret.